Versiclad is market leader in the manufacture of Structural Insulated Panels, distributing products into the domestic and commercial markets. Family owned and operated since 1986, we take pride in our reputation for quality and unique products that are manufactured in our Sydney factory, as well as our customer service and satisfaction, high levels of precision, combined with fast turn around times. Versiclad panels will not only keep you cool in summer and warm in winter, but deliver a comfortable atmosphere where ever you crave a relaxed environment. 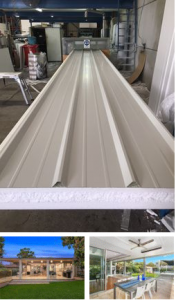 Self-mating, easily installed roof panels are available in a range of profiles and thicknesses to suit your desired insulation rating or trafficable free span requirement. Using insulated panels drastically reduces construction time and site mess compared to traditional forms of construction, and they are amazingly simple to install. With a reputation for quality and innovation, Versiclad’s core focus is manufacturing and supplying the best insulated roof, wall and ceiling panels in Australia. We’ve been delivering insulated panels for more than 30 years. It’s a mark we’ve achieved thanks to our ongoing investments in manufacturing equipment—and our commitment to bringing on the dedicated, and highly skilled employees to ensure we deliver a quality product to our customers .